In life, we can only move forward and not backwards, we all, in one way or the other have been through experiences we wish didn't happen to us, memories can be beautiful if we paint them that way, some of us still linger in the past, hoping for a redemption. 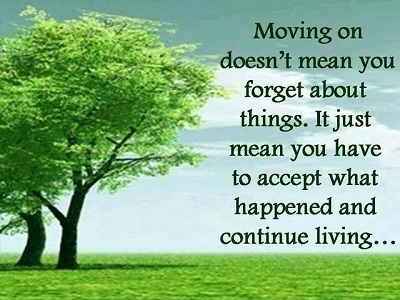 MOVE ON!! The journey gets exciting when we appreciate the little things we have. NOTHING, can ever bring the past back, we only get a piece of the past through memories. Let us appreciate the people around us, the little things they do that we don't really notice, each effort they make in our lives, and leave the past to the past, Life wouldn't be worthwhile when we dwell on things of the past. MOVE ON!! LET IT GO, Accept it, You can do this! !, Don't give the past the right to steal your joy, LIVE IN THE MOMENT, pamper yourself, you deserve no less. This is not an easy task, and trust me, I am going through it, the journey to the future can be scary and at the same time thrilling, but the good news is, You were born a conqueror!! I love this part. That's a fine piece @mimie we will endeavour to move on, taste the excitement and the thrills ahead of us. Keep creating such #untalented content. Congratulations! This post has been upvoted from the communal account, @minnowsupport, by MissMimie from the Minnow Support Project. It's a witness project run by aggroed, ausbitbank, teamsteem, theprophet0, someguy123, neoxian, followbtcnews, and netuoso. The goal is to help Steemit grow by supporting Minnows. Please find us at the Peace, Abundance, and Liberty Network (PALnet) Discord Channel. It's a completely public and open space to all members of the Steemit community who voluntarily choose to be there.